#174 – I’m a Spider Too! I can’t catch flies, but I can get a Frisbee! This was inspired by an influx of spiders in my yard and in the house. I’m pretty sure they’re taking over. Also, I’m pretty proud of this one. The concept is adorable and I really like how I drew the trees, which is something I have struggled with. 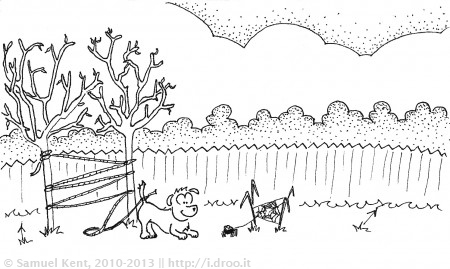 Author Samuel KentPosted on April 28, 2011 August 3, 2014 Categories Lunchbox DoodlesTags bugs, dogs, lunchbox doodles, spidersLeave a comment on #174 – I’m a Spider Too!